We’re really excited about the forthcoming Conditions of Mediation preconference on 17 June 2013. Later this week, we’ll be in touch with all of our keynotes, presenters and other attendees with some final details. There will be some posts here also, outlining further bits and bobs. But in the meantime, for those of you who will be remaining in London for a few days after the conference, you may be interested in an ‘urban media tour’ of West End London that Scott Rodgers (ConMed co-organiser/presenter) and Joel McKim (ConMed presenter) will be leading on 19 June 2013 (both shown doing a previous iteration of the tour in the photo above – though Joel’s looking away, at the Apple Store – credit to Joe Smith from the OU for taking it). It’s timed to coincide with the International Communication Association conference, but the tour is open to the public. All the details needed to register are below – we hope some of your can make it. This tour uses West End London as a lens into ‘the mediated city’. It explores how the city not only hosts, but is in many ways constituted through, media. City living compels us to use, need and even desire media content and devices in quite particular ways. Meanwhile, media forms, technologies and industries exist in and are even ‘built-into’ urban spaces: for example the street, the tube, the suburb, the bar, the public square. The aim of this tour is twofold: first, to highlight how the city provides a unique lens to critically study, understand and define media; and second, to use media and mediation as a lens to understand the city. Though a range of buildings and neighbourhoods associated with major media industries will be visited, the tour also focuses on observing some more unconventional forms of urban media and communication. Attendees will meet at the southwest corner of Fitzroy Square at 12.30pm (directions at Eventbrite link). 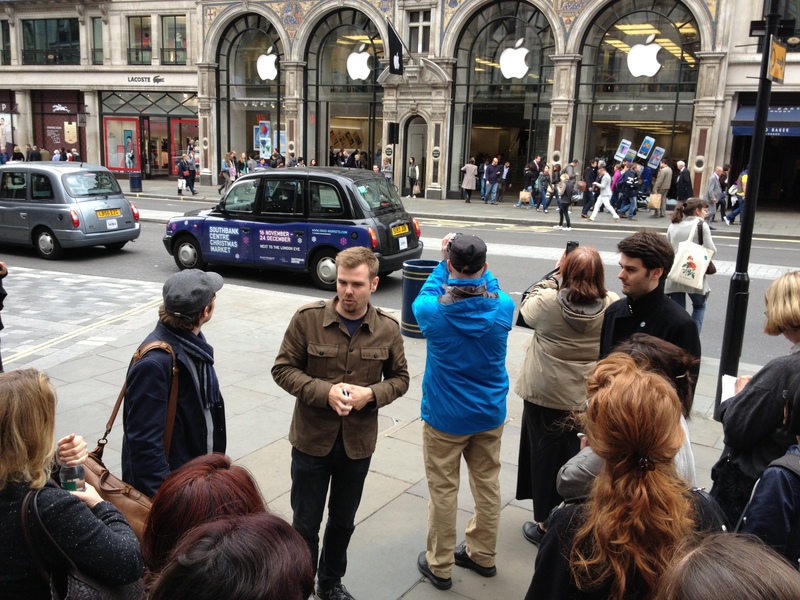 The tour lasts 3 hours, ending at Leicester Square.